A British quality Sunday newspaper is a joy to behold. Only three are left, now that The Independent on Sunday has folded. The three are the Sunday Times, the Observer and the Sunday Telegraph. Friends brought me a copy of the latter, a conservative paper, when they arrived in the US from England a few days ago. I am very grateful for the paper, even though it’s a few days old. In actual fact, it’s now eight day old, but still very relevant. On the front page are two articles that reveal a great deal about Britain today. 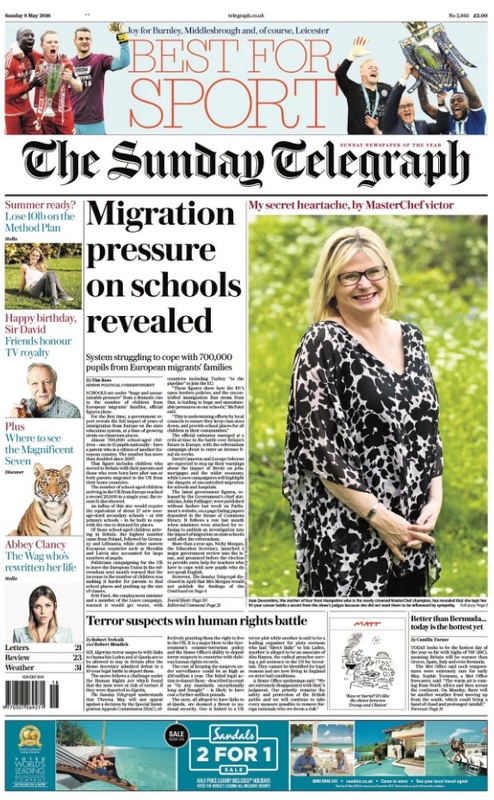 The lead article, “Migration pressure on schools revealed,” by Tim Ross, highlights the reality of an extra 700,000 foreign language pupils in British public (state) schools. (Multiply that by five to get the US equivalent.) Additional funds are needed when pupils speak multiple languages. The cost to the UK taxpayer will run into the multiple millions. The immigrants profiled in the article are from other EU countries. They do not include the latest refugees from Syria, Iraq and Afghanistan, nor do they include Indians and Africans who have been entering the UK for decades. Free movement of peoples within the European Union, including the United Kingdom, has led to this situation. It may be a decisive factor in June’s referendum, when the British people get the opportunity to vote on remaining or leaving the Union. A second front-page article bears the headline “Terror suspects win human rights battle” by Robert Verkaik and Robert Mendick. The first two paragraphs read: “Six Algerian terror suspects with links to Osama bin Laden and al-Qaeda are to be allowed to stay in Britain after the Home Secretary admitted defeat in a 10-year legal battle to deport them. The move follows a challenge under the Human Rights Act which found that the men were at risk of torture if they were deported to Algeria.” No doubt these men, linked to terror, will be entitled to receive state benefits in the UK. This means that their terrorist activities will be financed by the British taxpayer. The taxpayer has already had to pay out for ten years of legal fees to cover both sides in the dispute. After finishing the paper yesterday (Sunday) I read the Lansing State Journal. A front page article informed readers that Michigan is about to see a “surge” of Syrian refugees. Again, the taxpayer will have to foot the bill, pushing much-needed road repair further down the list of priorities. Additionally, there is also the prospect of future terrorist acts. Is anyone in government sane??? Staying in the UK, Prime Minister David Cameron described Donald Trump’s attitude to Muslim immigration as “stupid, divisive and wrong.” This does not bode well for the Atlantic alliance or the Special Relationship that has existed between Britain and America since FDR and Churchill. Mr. Trump said earlier today that he does not think he and Mr. Cameron will have a very good relationship should he enter the White House. “He (Trump) is also involved in a spat with new London Mayor Sadiq Khan. Further division no doubt lies ahead. Mr. Trump is also calling on Muslims “to turn people in.” In a television interview shown on British television’s ITV (not the BBC) the presumptive Republican nominee said he is not anti-Muslim, but rather anti-terror. He called on practicing Muslims to cooperate with the police in their fight against Islamic terror. Wednesday was quite a day on financial markets around the globe. China’s stock market continued to lose considerable value, down about a third in three weeks. Uncertainty over the future of Greece within the euro rocked European stock exchanges. And a technical glitch caused problems on the New York Stork Exchange, the world’s biggest. The latter was resolved before the closing bell. Greece should be resolved by the weekend. China, the number two economic power, poses the greatest threat to the world’s economy. There are increasing fears that the Chinese stock markets are one big giant ponzi scheme, with nothing tangible to support them. Late Thursday Greece handed over proposals to its European partners that will, hopefully, end the crisis affecting the beleaguered country. Greece was a member of the euro from the very beginning, using the new European banknotes and coinage from day one on January 1st, 2002. Today, the euro is used by nineteen European countries. Euro notes are used daily by more people than the US dollar. The two currencies are the two most important currencies in the world and are used as payment for most international trading. When Greece joined the euro, it was suddenly able to borrow vast amounts of money, which it did. It was not all used wisely. Following the crash of 2008, the country soon found itself unable to repay its loans. The dream currency had become a nightmare for the Greek people. Austerity was forced on the country by European bankers, making life very difficult for the average citizen. Austerity led the country into a downward spiral, which has recently been speeding up. In January, the left-wing Syriza party won the election, promising an end to austerity. However, European bankers, anxious to get their money back, want to impose greater austerity as a condition for offering Greece more help. Without help, Greece will not be able to stay in the euro. Without a doubt, Greek governments have been reckless. Government employees can retire at 48 on generous pensions. Corruption is rife, as also is tax avoidance. Germany is owed 68 billion euros by Greece, France 65 billion (add 10% to get the US dollar equivalent). Other countries have loaned lesser amounts. Total Greek debt amounts to 323 billion euros. Greece is asking for a further bailout of 53.5 billion. Although there is much talk of the Greek crisis, in a sense this is not about Greece, so much as Germany. Germany’s conservative government is taking a hard line, refusing to cancel debt or extend further loans. The Germans want their money back, on time. 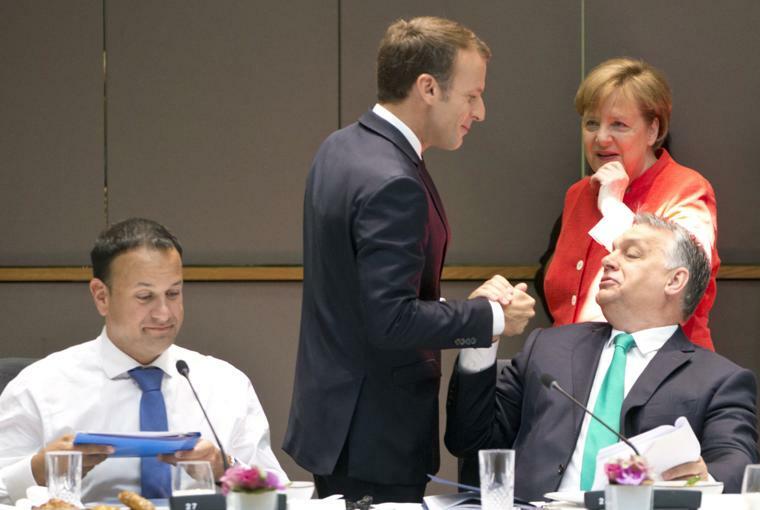 Germany’s stance is setting a precedent that will no doubt be repeated if any other country in the eurozone gets into trouble. Many have pointed out that when Germany was suffering economically after World War II, European finance ministers, including the Greek finance minister, generously cut Germany’s debt by 50%. If Germany would reciprocate now, Greece would be fine. The Greek people voted in a referendum a few days ago, rejecting the austerity demands placed on them by Germany and others. However, they still want to remain in the eurozone, which is an apparent contradiction. 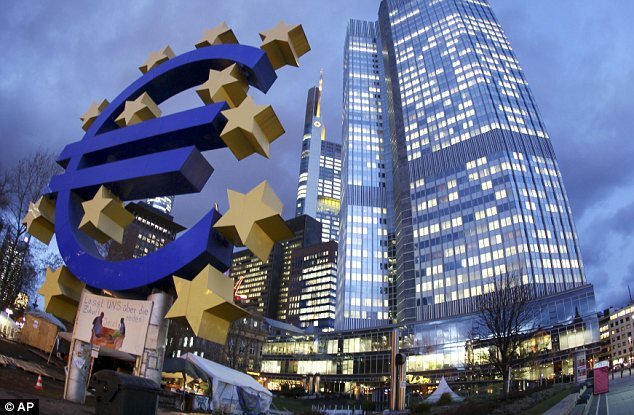 If they leave the eurozone, they could restore their former currency, the drachma, but this would cut them off from many of the benefits of the eurozone. Business loans and mortgages in euros would have to be paid back in ever depreciating drachmas, leading to many foreclosures. Importers would have to pay upfront in euros, which may be hard to get if Greece leaves the eurozone. Nobody wants a “Grexit” (a Greek exit from the euro), but it may not be possible to avoid it if the Greeks are unwilling to make the necessary structural changes to keep them in the euro. This crisis is not the only crisis facing Europe at this time. The continent is having to work through a number of challenges all at once. The migrant crisis is the second biggest issue confronting the European Union. So many people are fleeing from the Middle East and Africa into Europe that social cohesion is becoming a serious issue. One consequence of this massive movement of people is the rise of right-wing parties opposed to immigration. Ukraine is a third challenge for Europe. Russia’s invasion of parts of Ukraine threatens the peace of Europe. The possibility of Britain leaving the EU comes in at number four. There’s even a fifth challenge, and that’s the relationship between European countries and the United States. France and Germany are both upset over the American NSA spying on them and their leaders, even though it’s quite likely they are doing the same to America. Depending on how each of these issues is resolved, Europe could be very different in the near future.